Home | DINOSAUR PAINTINGS | American Lion Panthera Leo Atrox | Panthera leo atrox, 13" x 19"
Panthera leo atrox, 13" x 19"
American Lion. Photographic Art Print is printed on premium photo quality super "B" paper 13 x 19". 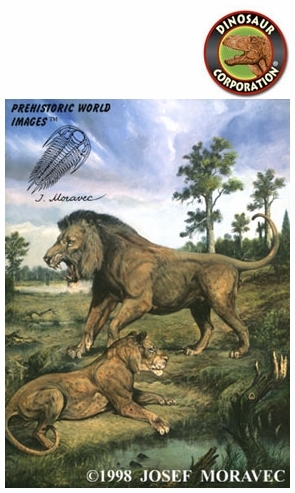 Panthera leo atrox by J. Moravec is in the art collection of Dinosaur Corporation. ▪ American Lion-Panthera leo atrox - Art Picture 8.5" x 11"
▪ Panthera leo atrox - Framed Picture 17" x 14"
American Lion-Panthera leo atrox - Art Picture 8.5" x 11"
Panthera leo atrox - Framed Picture 17" x 14"